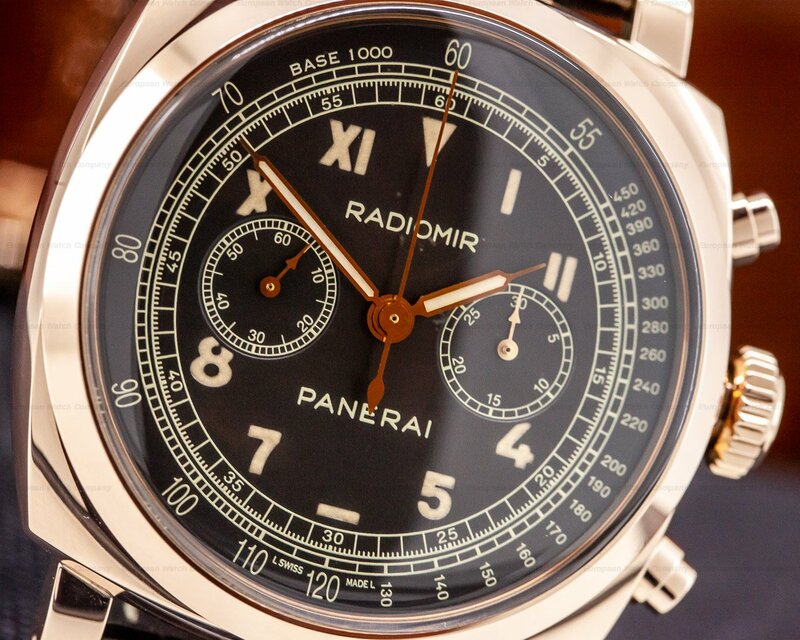 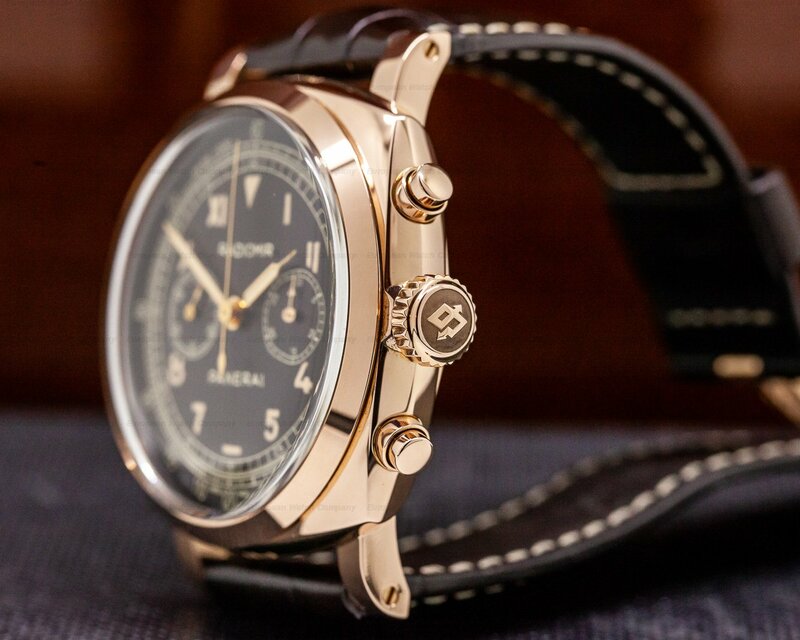 This is an 18k rose gold Panerai Radiomir 1940 Chronograph Oro Rosso PAM00519. 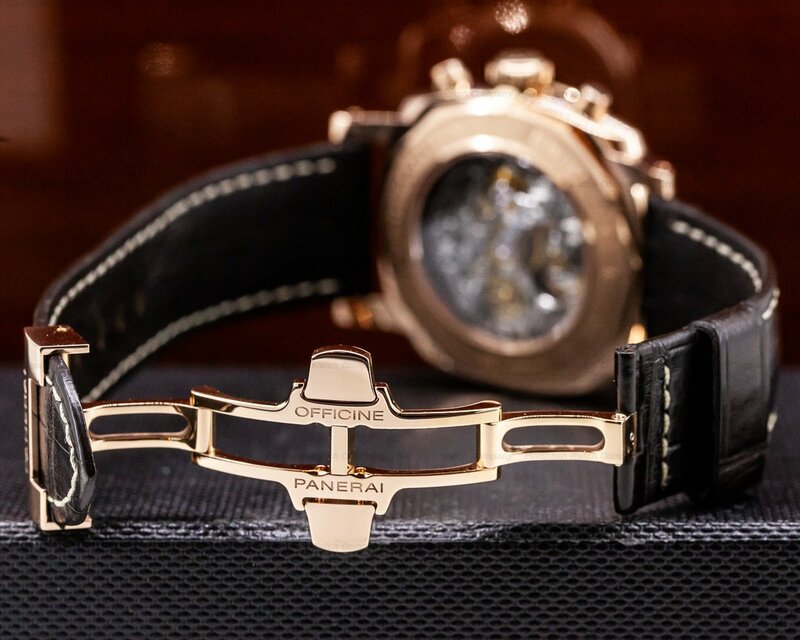 It has an alligator leather strap with an 18k rose gold deployment buckle, and a domed acrylic crystal. 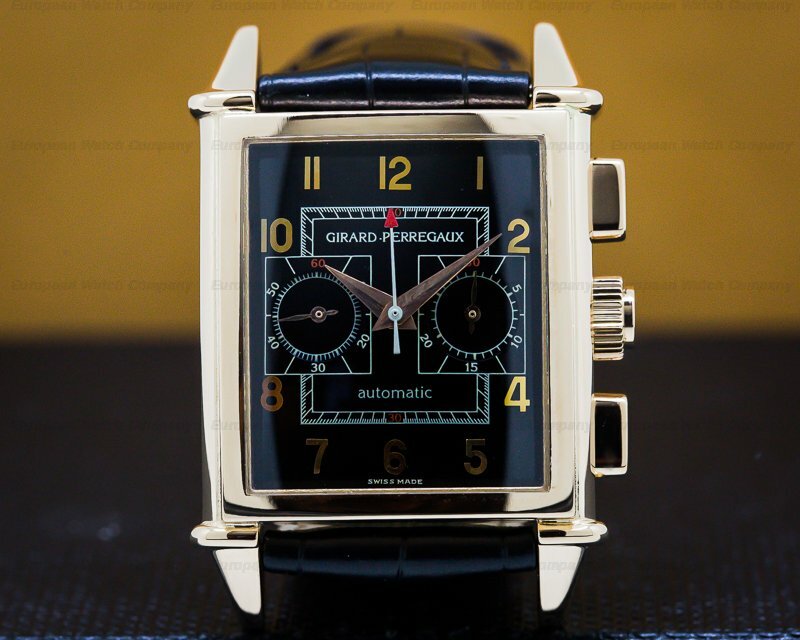 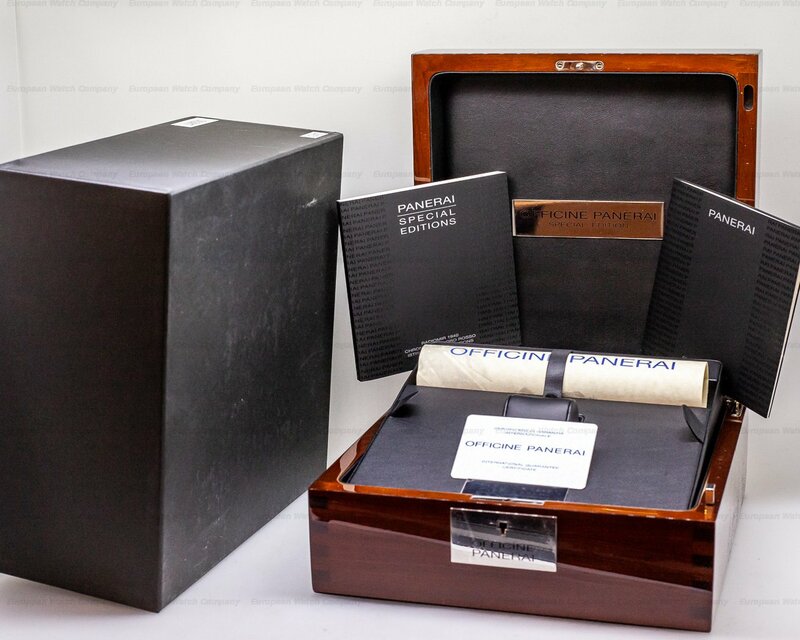 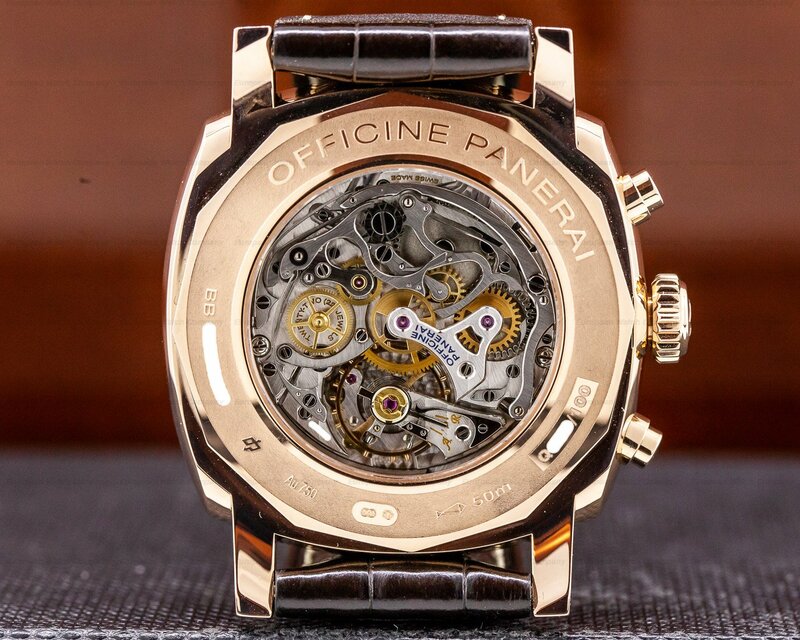 It has round chronograph push buttons, a screw down winding crown, and a screw down exhibition sapphire display case back engraved around the perimeter with "OFFICINE PANERAI – 50M," a serial number, and several hallmarks. 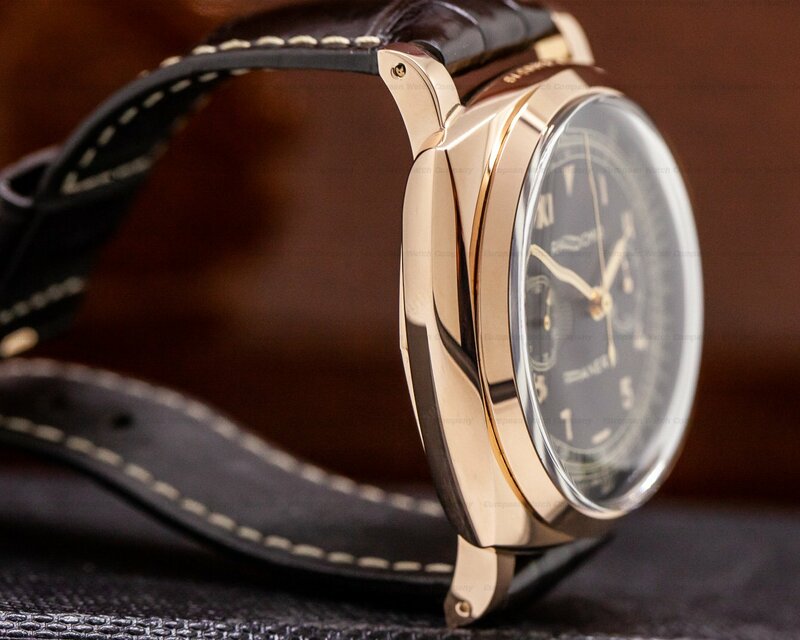 The 45mm diameter solid three-body cushion case, downturned lugs, and flat angled stepped bezel, are polished. 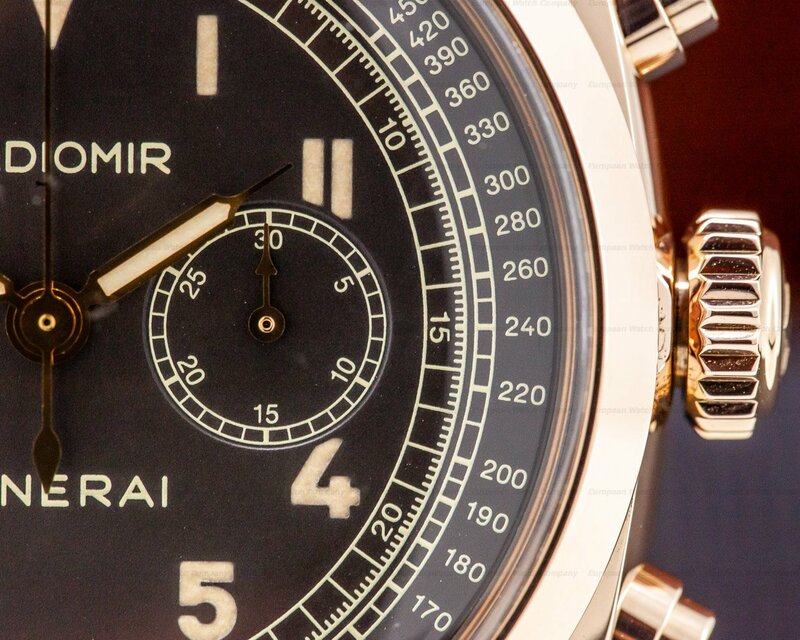 It has a dark brown "California" sandwich dial with luminous Arabic numeral hour markers from 4 to 8 o'clock, and luminous Roman numeral hour markers from 10 to 2 o'clock. 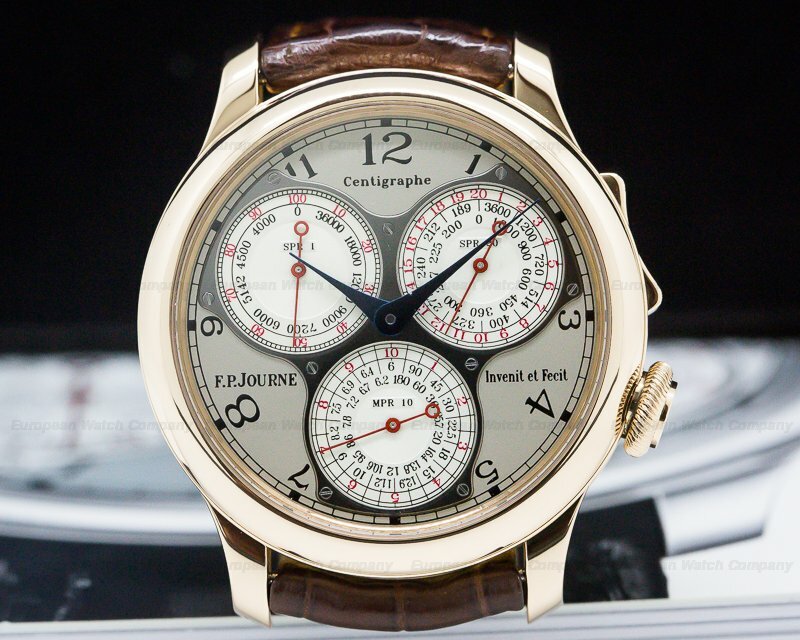 The luminescence on all the markings and Arabic numerals around the perimeter are cream-toned, including the outermost tachymeter ring to 450 UPH with a railroad-style graduation scale, and inside of that is a railroad-style 60-minute scale with Arabic numerals every five minutes. 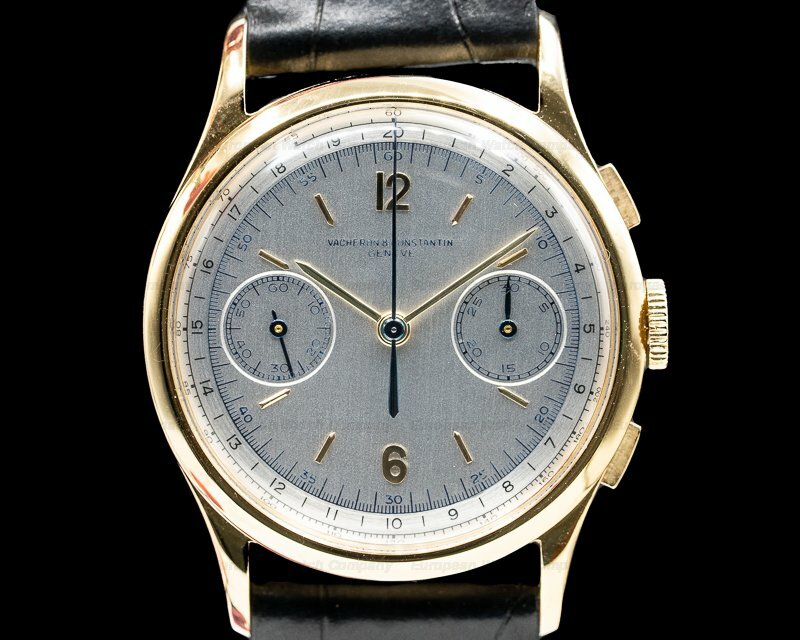 It has gold baton hands with luminous inserts and needle tips, and there is a gold center sweep seconds chronograph hand. 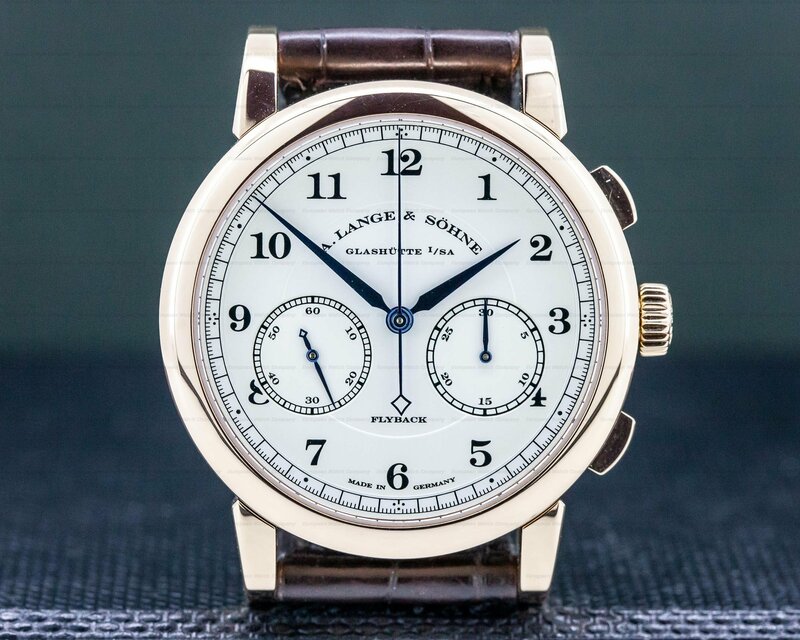 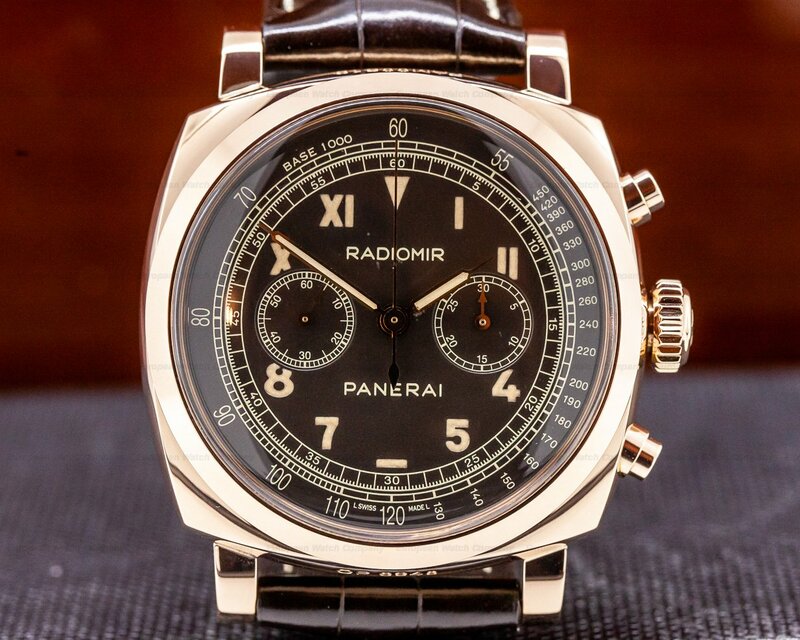 There are twin recessed subsidiary dials with luminous railroad-style rings, Arabic numerals, and gold indicator hands, including a running small seconds register at 9 o'clock, and a 30-minute chronograph totalizer at 3 o'clock. 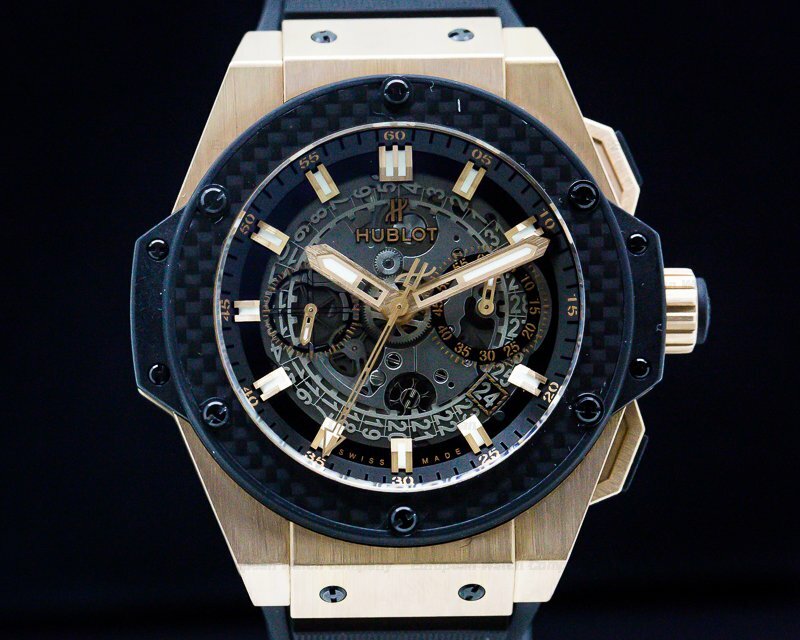 It has a 55-hour power reserve at full wind, and it's water resistant to 50 meters/165 feet. 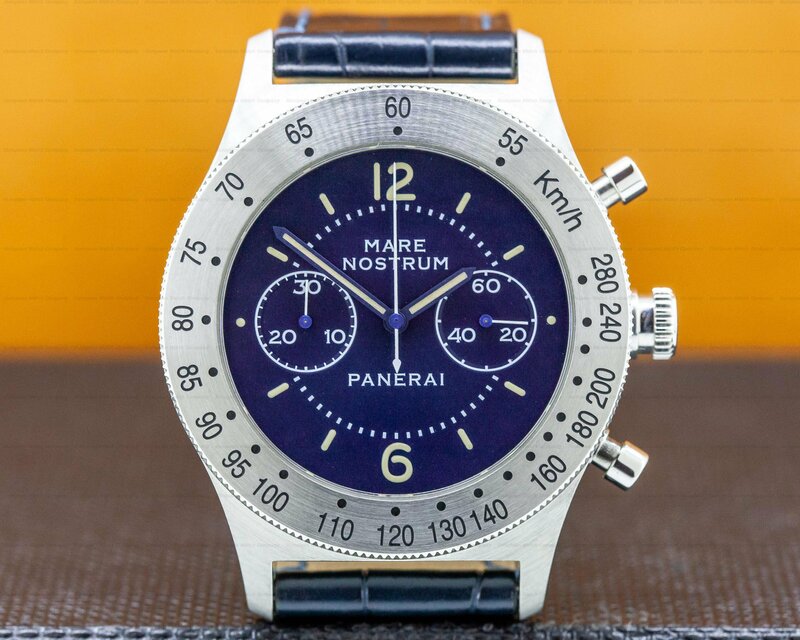 The 16mm thick case, dial, and movement are all signed. 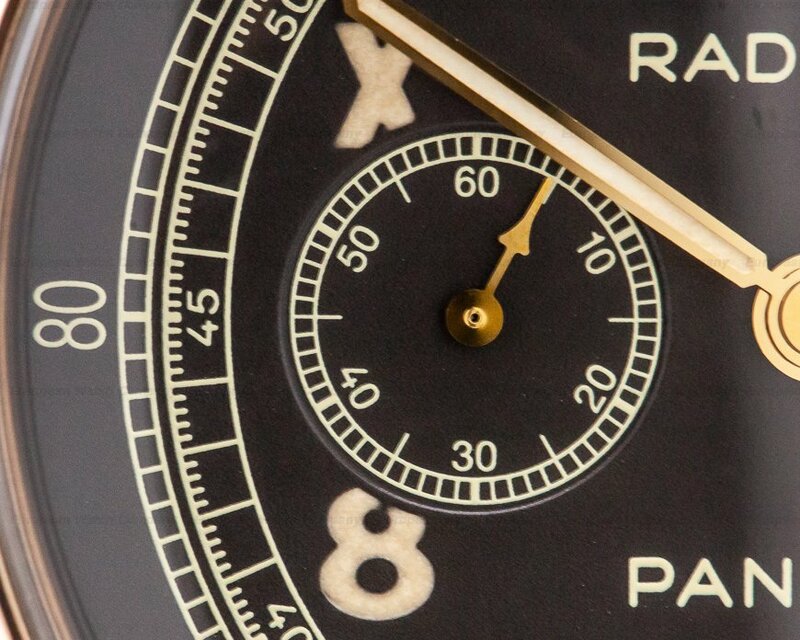 This Panerai Radiomir 1940 Chronograph Oro Rosso PAM00519 has a mechanical manual winding Panerai caliber OP XXV (developed on a vintage Minerva 13-22 base) column wheel chronograph movement. 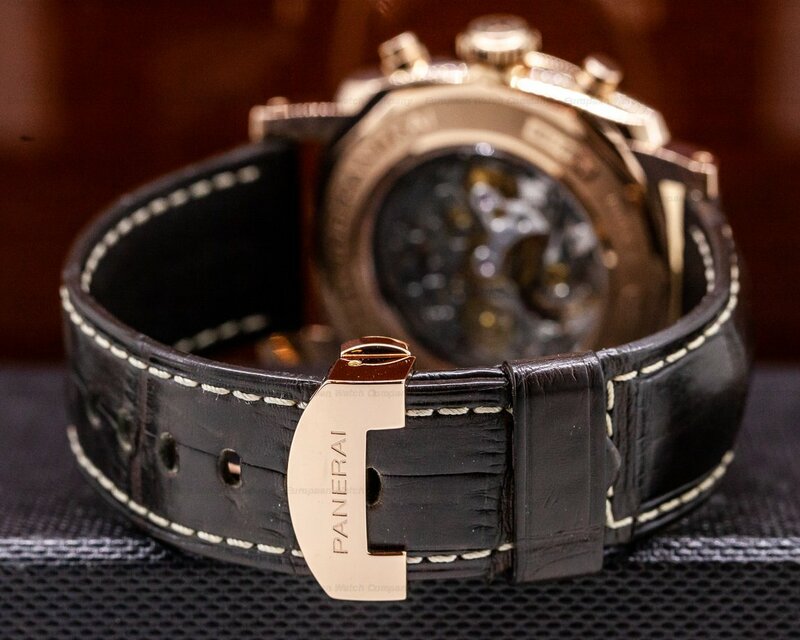 It's rhodium plated with cotes de Geneve embellishment on the bridges, and it's constructed with 22 jewels, an Incabloc® anti-shock device, and a monometallic Glucydur® balance. 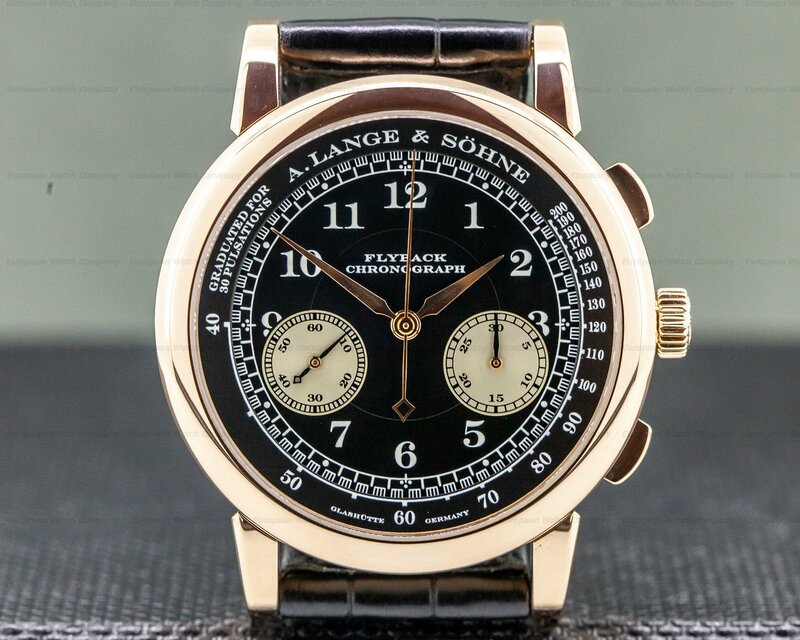 It has a straight-line lever escapement, a swan neck regulator, a self-compensating flat balance spring, and the mechanism oscillates at a frequency of 18,800 vph (2.5 Hz). 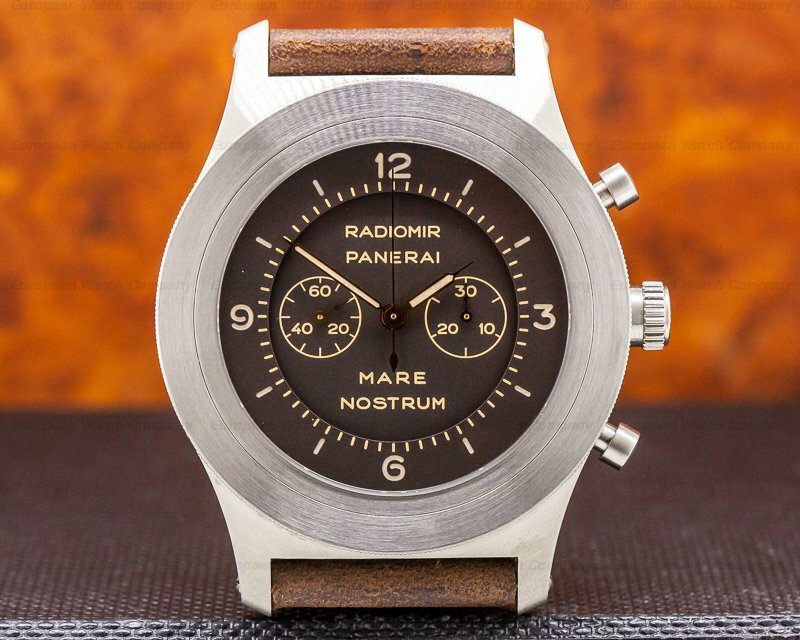 The Panerai Radiomir 1940 Chronograph Oro Rosso PAM00519 was released at the SIHH exhibition in 2014, and it was limited to 100 examples.